Last weekend I was thrilled to see and house in NYC a former student of mine from Buffalo, NY who was asked to test for his second-degree black belt in karate. His name is Kevin Fabiny. He is very different from other karate students, because since birth he has been severely limited physically. Born with cerebral palsy, he was for most of his life pretty much limited to a wheel chair. For this reason he was never allowed to participate in sports. This all changed almost 21 years ago when I was teaching Seido Karate at the State University of New York at Buffalo (SUNY). One evening before class as people were warming up, a bearded man in a wheel chair (he was a student there at this time) came to the edge of the mat and said something. I had no idea what he said. This time I understood him, and after thinking for a moment I said “yes,” but that I wouldn’t make special accommodations for him. If he fell down, he would have to get up himself. 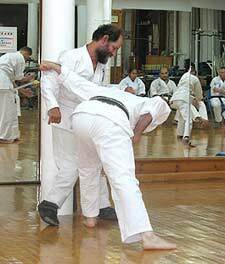 I was teaching Seido Karate (a club program) which was founded by Kaicho Tadashi Nakamura who had left a senior position as a member of a very hard, full contact style of karate (Kyokushin). 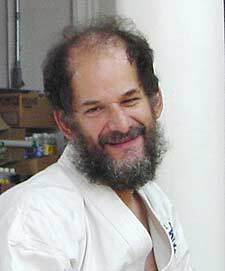 His great insight on founding Seido was that karate and its philosophy could benefit everyone, not just the young, strong and those who wanted to specialize in hard fighting. Kevin is an example of this challenge. Over the years I watched Kevin get stronger, and his growing ability to escape the wheelchair, to walk better without assistance, to climb stairs and to fend for himself. His movements improved, although he was always limited by poor coordination, muscle control, balance and strength. Kevin with a partner demonstrates a self-defense technique. But stubbornly Kevin came to class. When I was teaching Kevin had to use his motorized wheelchair to get to the subway and take it to one campus, then take a campus special handicapped vehicle between campuses, then get himself to the training facility and then at the end of class do the reverse to get home. There were even times when he came to class without his wheel chair, but this required extra effort to walk to the subway and ride a regular bus between campuses. I understand that he continues this two hour each way ritual even today. He would always arrive an hour or two before class so he could do his own kind of physical therapy—climbing stairs, walking around the running track, doing modified push-ups, etc. and then participate in class. He eventually achieved his black belt. (See “The Story About Kevin”). Kevin participating in free fighting, with the author, Sei Shihan Christopher Caile supervising (background). Over the course of an hour Kevin fought four or five opponents. While he is able to punch and block, Kevin has very limited kicking ability due to his physical limitations. Over time I began to realize the Kevin was also fighting for his life. He once told me that people with his condition often deteriorated physically which could lead to premature death. Thus his work ethic, his karate participation, was staving off physical deterioration. In Seido we have a saying, “Technique rather than strength and spirit rather than technique.” And while Kevin was limited in the first two, he remains inspirational in his spirit. In this way he taught me a lot. 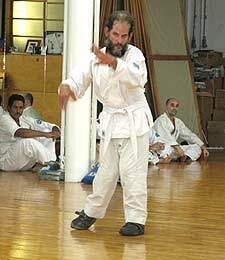 After I left Buffalo more than ten years ago, Kevin continued under Sensei Jeff Evenson and then Senpai Peter Macaluso when he took over the program. Kevin is now the senior student. He has been like the “Energizer Bunny.” He keeps coming to class, and keeps practicing. This year he was asked to test for his second-degree black belt. When I saw Kevin again I realized that this test would even be harder for him. Despite all his efforts, exercise and practice, he has lost some muscle strength and his balance has deteriorated a bit. Kevin told me that previously when he fell down, he could usually get up in place, but now he had to crawl to a wall or pillar and use that to help himself get upright. 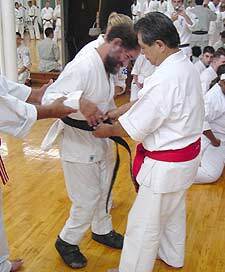 Kevin being awarded his second-degree black belt by Kaicho Tadashi Nakamura. His eyesight has also become more limited too. Never great, over the last few years he has totally lost sight in one eye. I think he is probably afraid for his future, although he doesn’t show it. One of the students who accompanied him from Buffalo said that Kevin told him where he wanted to be buried and how. But this last week I never saw any cloud over his thoughts. When I asked him about his comments to the other student, he told me of his father who was now 86 years old and that he has good genes. And in all the time I have known him, Kevin has never been bitter, or shown a negative attitude or anger toward his condition. Instead, he has always been upbeat, and quick with the joke or insightful comment. During his two-day test Kevin fully participated – he didn’t want special treatment. 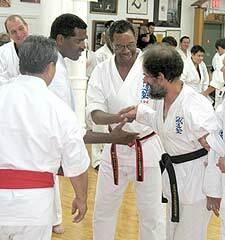 He free fought, demonstrated kata and self-defense drills and two man exercises with others taking their tests. Kaicho Nakamura and Sei Shihans William Best and Mike Reeves congratulating Kevin after his promotion. At this point you might be asking yourself, “How could a man so physically limited ever qualify for a black belt, much less a second degree black belt?” The answer is simple. Belts in martial arts don’t just signify strength or fighting ability (that’s why in most pure sports there are no ranks or belts). They also signify personal development, discipline and spirit. That’s also why there are junior belts. Those under 16 (sometimes 15) aren’t considered to have developed mentally to the point that they can exhibit a developed sense of morality, internal direction, dedication to practice and outward exhibition of etiquette necessity for award of a full black belt. Thus junior belts are considered incomplete, usually with a white or other color stripe down the middle. Kevin in his test over two days showed everyone something rare – limited ability totally over shadowed by spirit, of stick-to-it-ness, self-discipline and strength of commitment. It was inspirational. At the conclusion of testing, participants were awarded their belts. Kaicho Nakamura asked me to introduce Kevin and give some background on him and his studies. I recounted his history, his challenges, his work ethic as well as his keen sense of humor, his insightful knowledge. I also noted that the one time he had been attacked, he had nearly beaten up his assailant before other intervened. There was thunderous applause, and more than a few tears were seen on the faces of others. I want to thank Kevin for showing me his way, his spirit and dedication and as such he has become one of my teachers. And if in Buffalo on the street or at the University of Buffalo you see a partially bald and bush bearded man in a wheel chair, pay him some respect. If it is Kevin, he has earned it.